Been recommended a Ferroli boiler by an installer, and not sure if it’s the right brand for you? Below, we’ll cover everything you need to know about Ferroli boilers, including prices, reviews and all the best alternatives. A new boiler isn’t a small purchase. Typically, prices including parts and labour will range anywhere from £1,800 for small properties, up to £3,000 for large properties – we’ve detailed that in our guide to boiler installation here. With an upcoming purchase that large, it makes sense to do your research. Ferroli is an Italian heating product manufacturer, founded back in 1955. It wasn’t until the 1980s that they began exporting their products to the UK, and since then, they’ve grown from strength to strength. Typically, you’ll find Ferroli pitched against budget brands in the market place, rather than market leaders such as Worcester, Viessmann, Baxi, Potterton, Ideal and Vaillant. So, that should mean that if you choose a Ferroli, you’ll be getting it installed cheaper than any of the brands mentioned above. There’s a good chance that either you or your installer, has picked Ferroli boilers simply due to their price. Fact is, Ferroli boiler prices are some of the lowest out there. So, if you’re on a tight budget and are willing to compromise slightly, you’ll end up saving anywhere from £100-400 in comparison to an installation from a leading brand. If we take the Ferroli Modena 27kw for instance, that’s a boiler that’s going to suit a small-medium sized property. You can expect to pay around £650-700 (boiler only) from a plumbing merchant. This is close in output to the Worcester 25i. But you’d expect to pay around £900 (boiler only) for the Worcester. Asides from price, the big difference here, is the Ferroli Modena only comes with a 5-year warranty, and if you use an accredited Worcester installer like BOXT, you’d be getting 10-years on the 25i. So, what can you expect to pay as an overall installation price for a Ferroli boiler? Like anything, this will vary depending on the area you live in, and the prices your installer charges. However, for a boiler like the Modena 27kw, we’d expect to pay somewhere in the region of £1,700. It’s not just the boiler and labour you’ll be paying for here. Your installer will need things like a flue, chemicals to flush out your system, a boiler filter and fittings. You can check prices from local installers here. Directly compared to the 25i from Worcester mentioned above, we’d expect to save around £250 by fitting the Ferroli (installers such as BOXT that focus on Worcester can usually be more competitive). This could rise to around £350-400 if you’re using an installer that doesn’t specialise in Worcester. The main problem here, is Worcester have a bigger support team, not to mention the fact that the warranty is double the Ferroli, at 10-years. We always stress how important a long warranty is. Whilst 5-years is reasonable (and acceptable), we’d sooner pay a little extra and get an additional 5-years peace of mind. Not all Ferroli boilers come with a 5-year warranty, and that’s the minimum we’d suggest when forking out in excess of £1,800 for a boiler installation. As an example, the Ferroli iBoiler range only comes with a 2-year warranty. Regardless of the product’s quality and reliability, we’d prefer to stick to boilers with a longer warranty; 2-years just isn’t enough on a potential £1,800+ purchase. The Modena range from Ferroli comes with a standard 5-year warranty, which is adequate. However, there is the option to upgrade to a 7 or 10-year warranty at point of purchase. So, if you go for the Modena, it makes sense to upgrade to a longer warranty. One thing Ferroli pride themselves on with the Modena range, is the lack of moving parts. There are only four moving parts in the Modena boiler. Not only does that mean it’s (potentially) less likely to break, if it does, your boiler repair company isn’t going to struggle to figure out what the problem is. That’s going to reduce the cost of any repairs you’re liable for in the future. 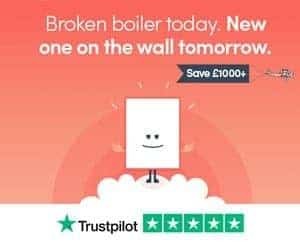 Like when you buy any product, it’s worth researching online reviews, and that’s especially the case before investing upwards of £1,800 on a boiler installation. Unfortunately, Ferroli boilers don’t get fitted in the volume of brands such as Baxi or Worcester. And, that’s going to mean that reviews are a little thin on the ground. However, we did find that over on Trust Pilot there are a dozen or so reviews giving them an overall 3/5 star rating. And, there are further reviews over at Review Centre. Only 25% of people that have left reviews on Review Centre would recommend Ferroli. Which Boiler Brand Should You Buy? The consensus surrounding Ferroli seems to be split. From my time working at a plumbing merchant I know there are installers that swear by them, but there also plenty that focus on fitting boilers from other brands. In our opinion, the best boilers come from the likes of Worcester, Baxi, Vaillant, Potterton, Ideal, Viessmann and the likes. They vary in price and are usually more expensive. Paying a little extra is going to get you a reliable boiler with a long warranty. And, that’s going to remove the need to spend money on repairs in the short term, as well as another costly boiler replacement in the future. Remember, there are ways to get boilers installed from these leading brands much cheaper than the average. A typical example would be by using a company like BOXT. They’re part owned by Bosch, meaning they get Worcester boilers extremely cheap. The result is that their prices (total installation cost) aren’t far off the price of Ferroli’s when fitted by a local installer, and they come with a longer warranty. Thanks for reading our guide to Ferroli boilers. Still confused about the best brands and the costs of installing a new boiler? Check out our guide to combi boiler installation. And, we’ve also got a tonne of combi boiler reviews that you can read through here.